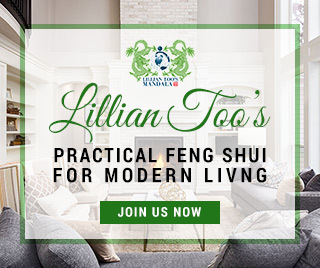 Marie-Lise Chabtini introduces the powerful symbol of healing that is widely used by REIKI healers the world over and shares additional ways of using it to enhance the chi energy of space, discovering in the process its close relationship with symbolic feng shui. Think of it as being part of our spiritual anatomy, connecting the physical body with our higher selves. This makes it an effective way for the two auras of the self to communicate and maybe that is why it is so effective as a sacred meditation and healing tool. Many say the symbol originated in Tibet, although no records exist, but its powerful effects have created its own validity. For healing purposes, Tibetans created candlelit rooms within which they placed a large oval bowl filled with several inches of water, representing the waters of life. In the center of the water, the Antahkarana symbol, usually made of silver, is placed. One wall is of polished copper polished creating a healing mirror; another wall is adorned with paintings depicting other healing symbols. The healer meditates on the symbol using his or her concentration to unite the energies of the symbol with that of the person requiring healing. The Antahkarana symbol creates an energy that has a direct effect on the human aura, directly reaching chakra points in various ways. This depends as much on the size of the symbol as on the pattern created by the symbol. Visual images of powerful symbols are of course nothing new. It is an age-old practice that pops up in many different cultures. Yantra meditation for instance uses visual images to reach the consciousness. The Antahkarana is a very ancient healing and meditation symbol that has been used in China and Tibet for thousands of years. Today, it is a widely known symbol which those who use it claim has a consciousness of its own. The symbol is so powerful it can work independently of outside energy. It interacts directly with your aura and your chakras; and it knows how to vary its healing effect according to what you need at the time of use. As a healing tool, it helps to release energy within a Taoist microcosmic orbit, in the process creating an energy flow up the main channel of the body and down the functional channel. This energy flow has a grounding and cleansing effect on the body; and as it activates the chakras, it heals the organs associated with each of the chakras. Spiritual energies travel up the spine, over the crown chakra, and down through the front of the body to the root chakra and back up again, continuously moving around and around. This flow of energy balances the chakras and prevents excessive build up of energy in any of the chakras. The effect is often invigorating, adding a noticeable boost to one’s vitality. Here, it is the effect of the symbol on the human chakras that bring about healing and a growth spurt of vitality. I will not talk much about chakras this time. The technology of chakras deserve much longer than just few words. For those who don’t know, just imagine that chakras are essential batteries in our body, each battery being responsible for charging a whole department. (Imagine the picture as a supermarket with 7 aisles of products with different functions: cleaning, animal food, etc.) The extraordinary thing about these batteries is that they last a lifetime and they are RECHARGEABLE. So your chakras are amazing centers of healing energies. Indeed, all spiritual therapies and cures use the chakra system to rejuvenate the human body. 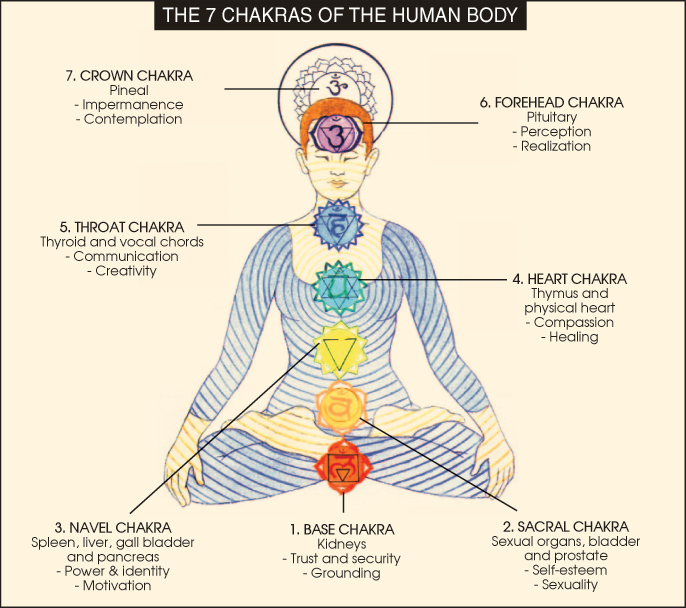 The illustration below lists the emotional or physical aspects of each of the seven chakras. You can use it to help you visualize your own chakras and put concentration on each in turn to make you feel better. Simply focusing attention on your own chakra is itself a powerful exercise. Healing of the associated organs or emotional aspects indicated takes place immediately and when you also place a symbol of the Antahkarana on that chakra point, healing begins instantly. Chakras have many dimensions but this is a simple way to use them for healing. The Antahkarana is a multi-dimensional symbol which at first looks like a two-dimensional hexagon with three 7’s inside a circle. These signify the seven colours of the rainbow and the seven chakras. 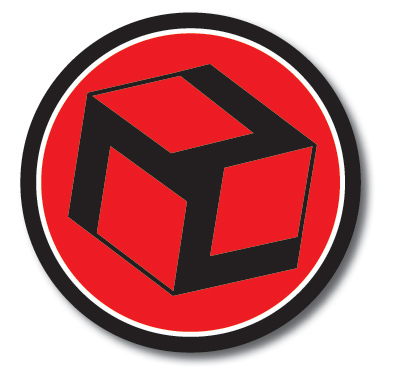 As a 3-dimensional cube, its potency is enhanced considerably as this evolution from 2 to 3 dimensions is what helps the consciousness to access the higher self. How does the Antahkarana benefit us? As a remedy used to fight illness, the symbol is most effective. I know for a fact that this is one of the symbols used by Lillian to thwart illness star afflictions. She agrees that the Antahkarana works directly on the subtle energy vortexes of human bodies around it. Simply placing the symbol in any room or space is usually sufficient to generate an illness-free environment. The symbol cannot cause harm as it works directly through the higher self. 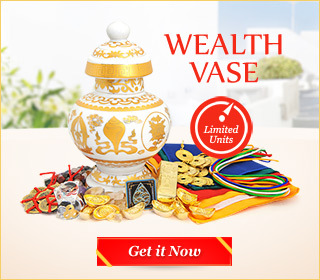 Objects placed between two of the Antahkarana symbols will be cleansed of negative energy. Placing male and female versions of the symbol on a wall will generate the power to neutralize every kind of negative energy. 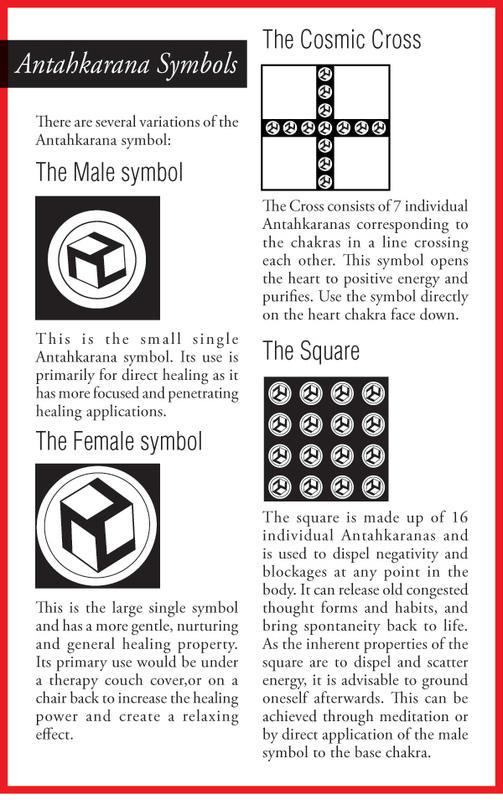 The Antahkarana symbol will also neutralize negative energy that may have collected in items such as jewellery or crystals simply by placing the object between two symbols. Symbols placed under mattresses and massage tables or chairs have a very positive effect on the sleeping. Just lying down on the symbols for three minutes will reverse the body’s magnetic poles, instantly rebalancing the chakra points. This is what makes people attentive and focused as opposed to feeling listless, tired and sleepy. Water can be purified in nine minutes by placing upon the Antahkarana symbol. Any kind of radioactive or other contamination is removed. And as the human body is composed mainly of water, the symbols work in the same way on the body. If the energy needs to be concentrated on a small spot, use one of the corners of the symbol and press it upon the area for three minutes. The Antahkarana is a valuable tool for meditation due to its 3-dimensional qualities. Regular use of the symbol generates greater inner clarity. It helps the mind go deeper into the subconscious, and hence vastly improving results from meditations, affirmations and visualizations. Meditation is done by gazing directly but gently on the symbol, allowing your conscious thought to drift and take shape. As you relax, you could experience subtle shifts in dimensional level and you may experience many kinds of visions within or surrounding the symbol. This has a powerful effect on the mind, enhancing its clarity but also causing it to relax vastly. If you set aside ten minutes a day to meditate on the Antahkarana , it is believed your immunity goes up and you will not get sick. Your constitution becomes much stronger. The psyche will soon develop a calm demeanour, suggestive of a feeling of peace and security. In case you feel a flying sensation which disturbs you, just instantly open your eyes and come back to earth. However, Antahkarana meditation should not be seen as a way of relaxation; instead, it should be used to enhance your health and body strength. Always ask yourself first what you are suffering from. Relate your pain to one of the chakras according to their emotional aspect. Then place the appropriate symbol face down on that chakra. Use different sizes in order to focus or widen the energies. Size matters. When I’m very sad with my heart filled with unbearable pain, I place the symbols arranged as a Cosmic Cross on my heart chakra face down so it releases all the pain. Believe it or not, a few minutes later, the pain fades away and makes me feel so much better. Just like a miracle! I also believe in detoxifying the water we drink. Just place a glass of water on the symbol for ten minutes and then drink… you might say it’s psychological, but when I drink, I feel good!